One of the oldest platforms is still the biggest vehicle for new music discovery, even among more dedicated music fans. 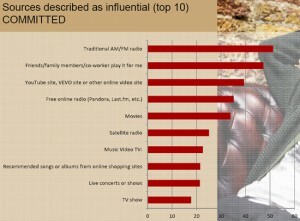 In a just-released joint study from NPD Group and NARM, FM (and AM) radio consistently emerged as the most important place for discovery, with word-of-mouth falling second. You’d think platforms like Pandora and places like Pitchfork would beat out local stations and their repetitive playlists, at least among more dedicated music fans. But here’s a look at the ranking for the most dialed-in, ‘committed’ music fans. This is a group spends an average of $267 per year, plus an additional $139 on live shows. Streaming sources like Pandora, VEVO, and YouTube are definitely in the picture, and a continuing expansion into apps and smartphones will help. Perhaps unsurprisingly, Spotify and iTunes are nowhere to be found on this list. The story gets even more traditional with another group, an older and more ‘comfortable’ segment often raised on radio. Here, it’s all about broadcast and word-of-mouth, with a less tech-heavy top-ten.